Trevor: How did you end up writing a history of things that happened inside a video game? When and how did the idea occur to you and what made you decide that this was something significant enough that you were going to devote your time to it? 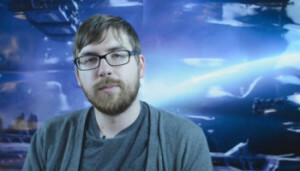 Andrew: I think it’s common knowledge in the games community that EVE Online is a really special and unique game. Once in awhile we hear incredible stories from the EVE community about the amazing things that are possible in that game. Stories of heists, skullduggery, and immense battles between thousands of players. But all we could ever see was the tip of the iceberg. There was never any true understanding of what was happening inside EVE. In 2013 I became curious to understand more of what had gone on inside EVE, and so I started spending my nights taking notes and reading every story I could get my hands on. Until eventually I really began to understand that learning about EVE’s history was impossible because it had never been consciously written down before. In order for me to learn the stories of EVE and the grand narrative of space conquest that it is, I realized I would have to write it myself. But in those early days I found enough jaw-dropping stories that I knew this was a project I was willing to devote two years of my life to. Trevor: I think we all go into a project with a rough sense of a framework and a timeline for the history. Were there any big changes to the overall structure of your historical narrative that came in over the course of your research? If so, could you tell us a bit about what in your process prompted those shifts? Andrew: There were no shifts in my historical narrative, because I didn’t start out with one. EVE is a historical blank slate. Prior to my work, the history of this game was mostly told through very loose oral stories that were rife with inaccuracies, and left enormous holes in the understanding of this virtual world’s progression. So there were very few shifts because I simply started at the beginning and worked my way toward the present, writing essentially the first draft of this history. Which is great in some ways, because I didn’t inherit the assumptions and inaccuracies of previous historians. Trevor: You raised nearly a hundred thousand dollars on Kickstarter to write a history of what happened in an online video game. What do you think that says about games and culture? 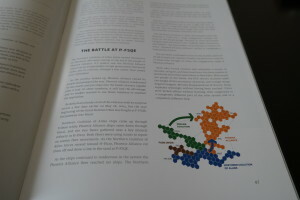 Andrew: To me it says that people are awed and inspired by what goes on inside virtual worlds. I think we all understand that there’s something special about virtual places, and we’ve been ignoring them for too long. We tend to treat online worlds as if they’re somehow less real than our physical reality, but they’re not. They’re places and communities, and they’re the medium in which a lot of truly amazing and truly human things occur. Trevor: Can you talk a bit about the kinds of primary sources you used to develop your history? How did you go about doing your research and what kinds of issues? Along with that, it would be great to hear about any issues you ran into related to the reliability and authenticity of any of those sources. Andrew: EVE is very fortunate in that it has many big-time movers and shakers in its community. The people who make history in EVE tend to have the loyalty of thousands or even tens of thousands of people. So while the average EVE player from 2003 is now impossible to track down, these more famous individuals can often still be contacted through their impressive social ties. Authenticity never emerged as a large problem. As I mentioned, in order to contact these people you sometimes need to get in touch with their inner-circle first. So there’s very little chance of them being an impersonator. Though that is something I was worried about in my early reporting. The process of learning this story required me to get extremely embedded in this community. I had to develop dozens of sources, and I conducted approximately 70 interviews in order to get multiple sides of every story. These were usually high-ranking diplomats, politicians, and military officials. 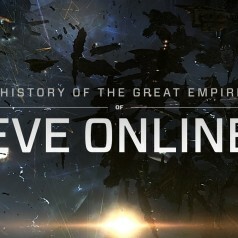 Trevor: On Play the Past, we have had a few explorations of MMOs from historians exploring Oral history, reencountering and replaying their pasts, including some discussion of EVE online. Given your experience doing this historical project and your perspective as a journalist I would be curious to hear the extent to which you think your approach is similar or different to those of historians? Andrew: I think the work I do is identical to traditional historianism. It’s all about conducting lots of interviews to understand the human remembrance of events, and then using documentation to figure out which of those remembrances are accurate, and begin to understand the true chain of events. It’s different from oral history in that I made a large effort to examine people’s stories using verifiable data points to back up their claims. Trevor: It strikes me that the focus on “great empires” of EVE is very much a sort of “great men” notion of history. A lot of the work in history has increasingly moved to be more bottom up, or to explore the experiences of “everyday people”. How would you situate your history in relation to those terms? Further, to what extent do you think those kinds of concepts make sense as part of a historical frame for understanding a virtual world where people get to play at the roles they chose as opposed to the lot they are given? Andrew: I think Empires of EVE is very much oriented towards the Great Man Theory in that it focuses heavily on the movings of empires and the grand events of history. I think it’s essential to write that history first, because it provides a framework where you can later go back and understand what the average person’s life was like in the shadow of these major events. But it doesn’t do much good to tell the story of an average person if history doesn’t yet understand the context in which they live. Trevor: Now that the book is out, what kind of feedback are you getting about it? Are you mostly hearing from Eve players? Or do you get a sense that a lot of other types of folks are reading it too? To that end, it would be great to hear a bit about how different kinds of readers are responding. Andrew: The most common piece of feedback I’ve been hearing is even people who have never once played EVE are really enjoying the book. It’s proving highly popular with EVE players as well, but the thing I’m most proud of is that I was able to translate this complex story into something that the average reader can understand. I originally set out to make something that was highly respected by the EVE community, but that was still fun and interesting to the average person. Judging from early feedback I more than met that goal, and I’m really excited for this book to be out in the world.